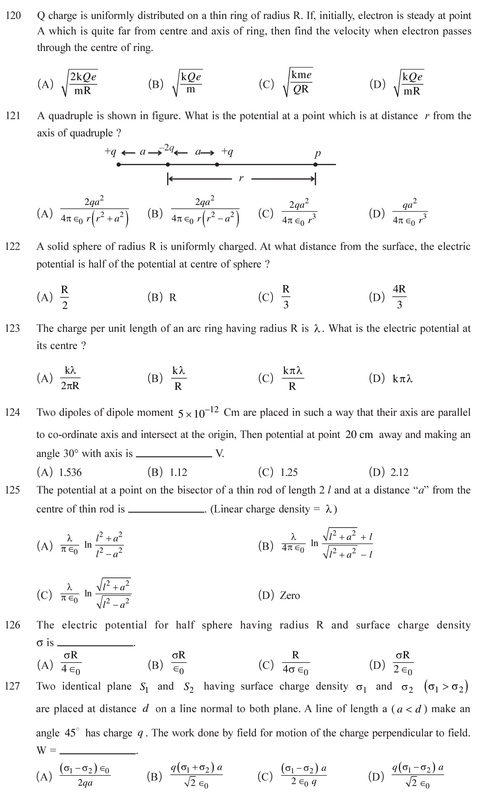 NCERT Solutions for Class 12 Physics Chapter 2 Electrostatic Potential and Capacitance in PDF form with extra questions for practice based on competitive exams in Medical and Non-medical stream. 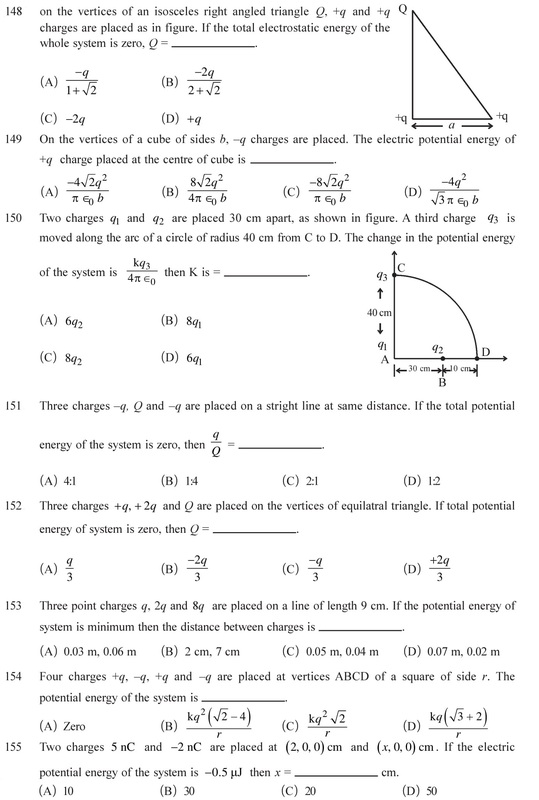 NCERT Solutions of this chapter are given below in PDF and for online view. 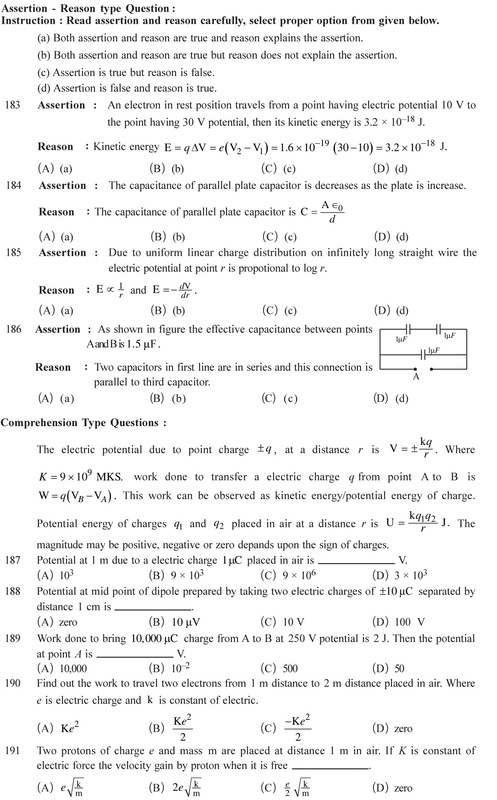 Download NCERT Solutions for Class 12 Physics Chapter 2 Electrostatic Potential and Capacitance in PDF form with the links given below. The following are the MCQ for the ample practice for the competitive exams like JEE, NEET, and other medical and non-medical exams. 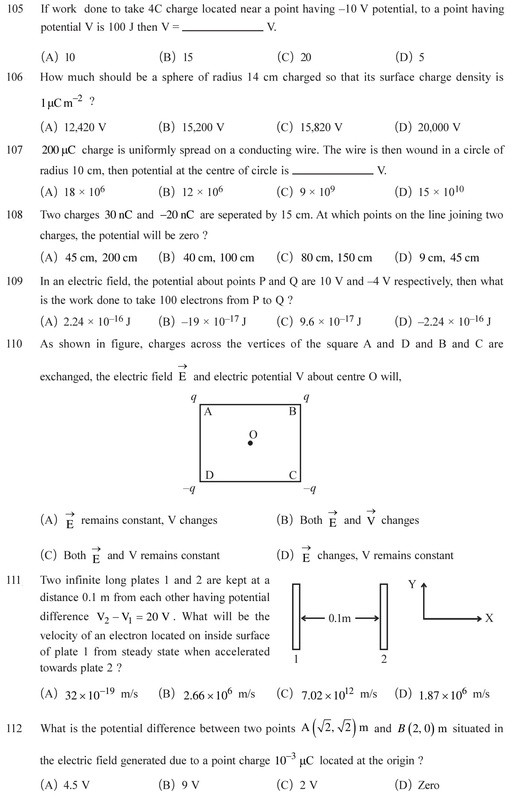 For the questions from 1 to 104, which are based on Electrostatic charges, Click here. 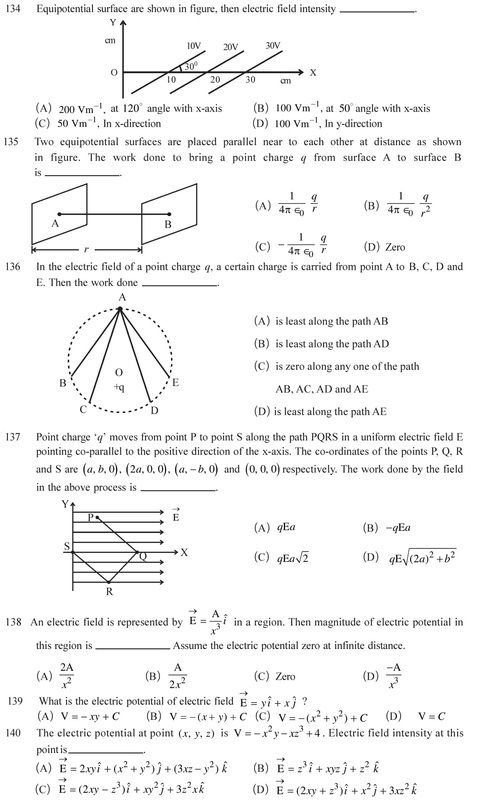 Electric potential and how it differ form electric field, potential due to a charge, its units, dimension, and the factors affecting. 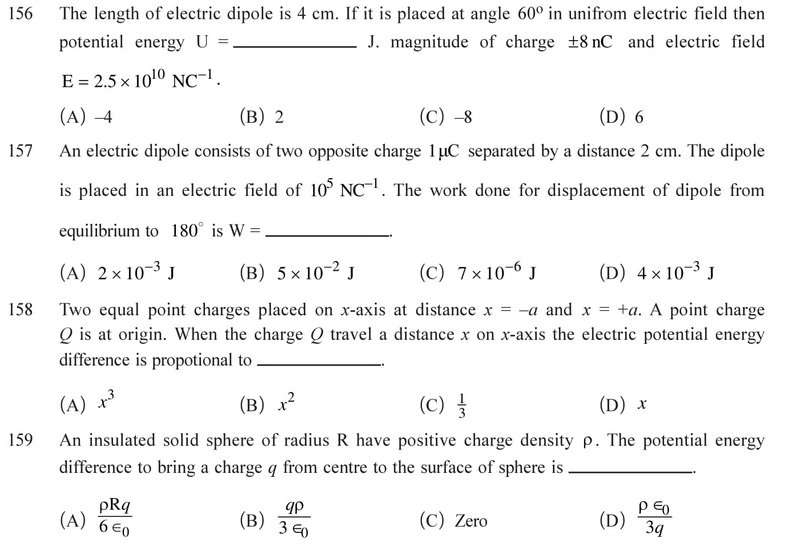 Potential difference, negative and positive potential, Zero potential due to system of charges and work done by electric field. See Answers. 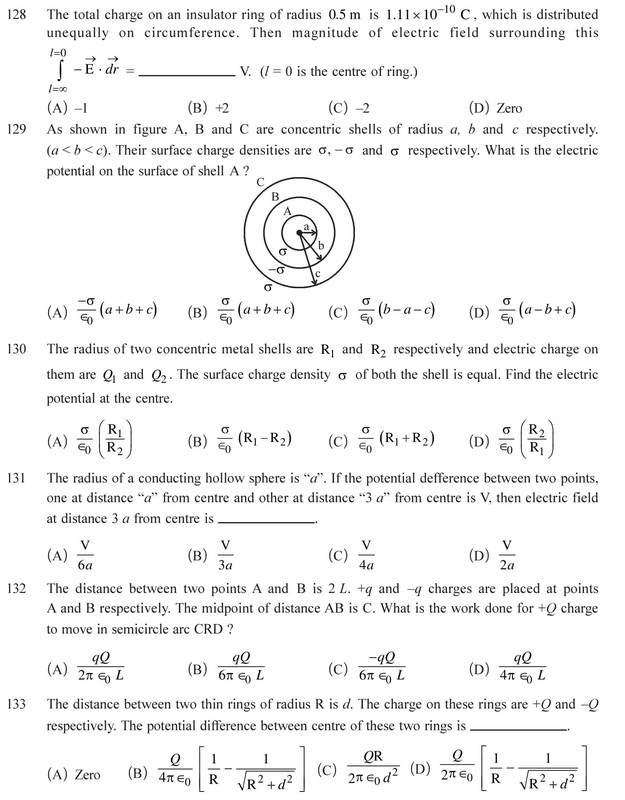 Electrostatic potential due to electric dipole, potential at its axis and equator, electric potential generated due to system of charges, potential due to continuous charge distribution and potential due to a shell having equal charge distribution. See Answers. 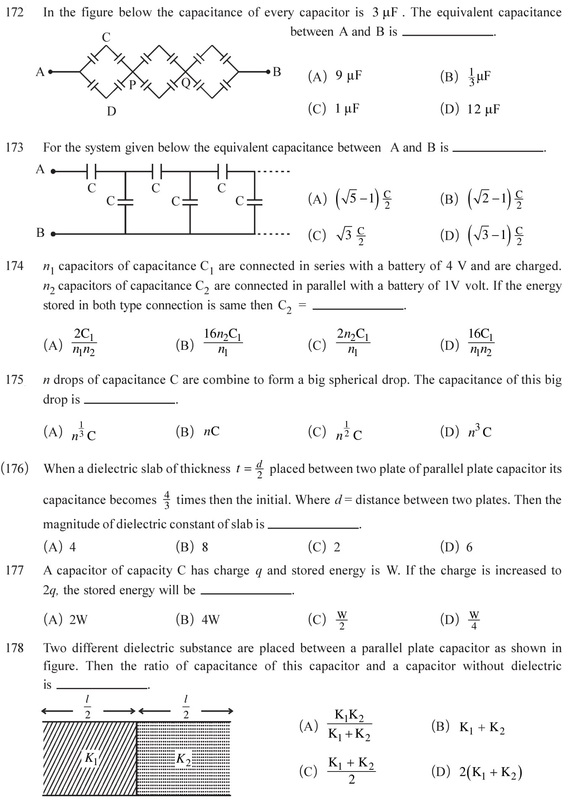 Equipotential surface and relation between electric field and potential. 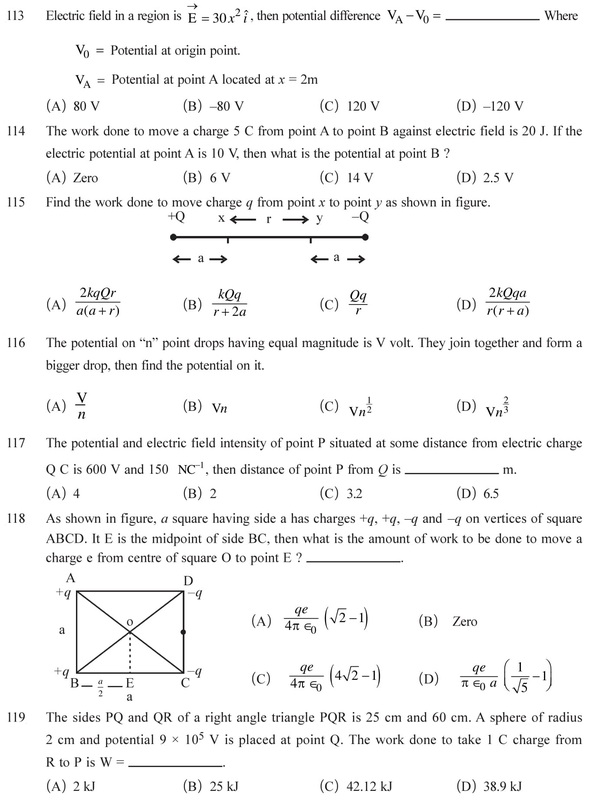 Questions based on the concepts like the potential difference between any two points on equipotential surface is zero, the work done to move a charge on equipotential surface is always zero, etc. See Answers. 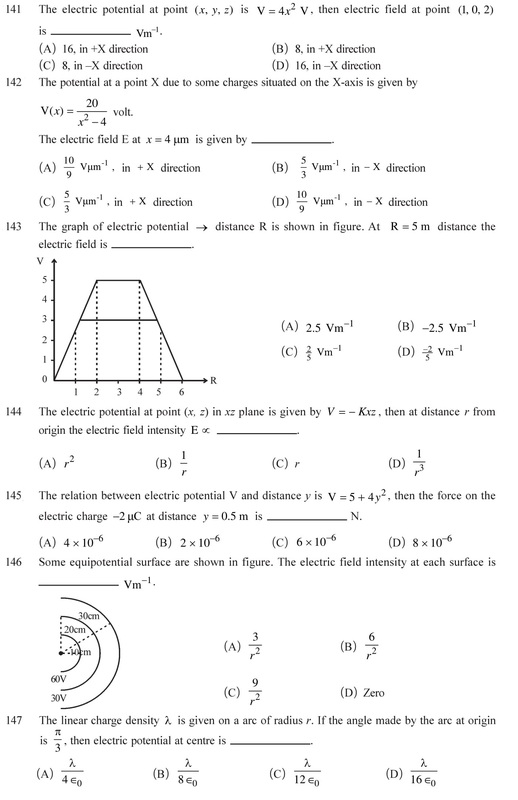 Electric potential and electric energy due to system of charges, Potential energy of an electric dipole in an external electric field and Effect in the case of a metallic conductor placed in an external electric field. See Answers. 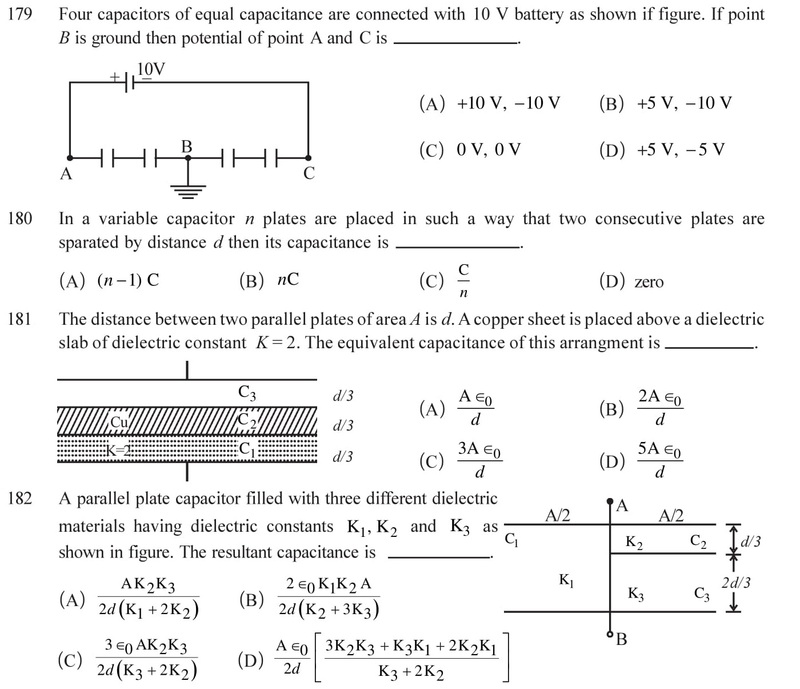 Parallel plate capacitor, cylindrical and spherical capacitor, combination of capacitor in series and parallel, mediums of different dielectric constant between the plate, charging and discharging and application of Kirchhoff’s law on capacitors. See Answers. Questions based on assertion – Reason type and comprehension type. See Answers. 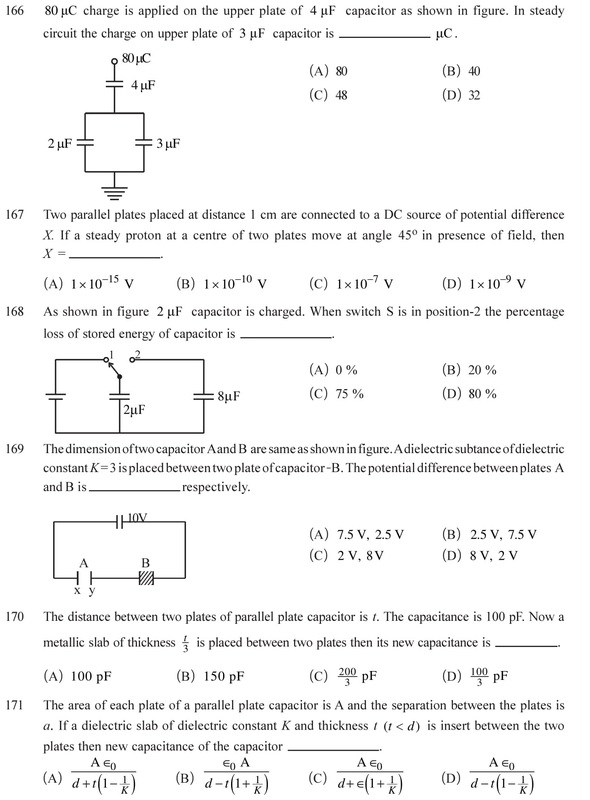 105 (B), 106 (C), 107 (A), 108 (D), 109 (A), 110 (D), 111 (B), 112 (D), 113 (B), 114 (C), 115 (A), 116 (D), 117 (A), 118 (B), 119 (C), 120 (A), 121 (B), 122 (C), 123 (D), 124 (A), 125 (B), 126 (D), 127 (D), 128 (B), 129 (D), 130 (C), 131 (A), 132 (C), 133 (D), 134 (A), 135 (D), 136 (C), 137 (B), 138 (B), 139 (A), 140 (D), 141 (C), 142 (A), 143 (A), 144 (C), 145 (D), 146 (B), 147 (C), 148 (B), 149 (D), 150 (C), 151 (A), 152 (B), 153 (A), 154 (B), 155 (C), 156 (A), 157 (D), 158 (B), 159 (A), 160 (D), 161 (A), 162 (A), 163 (C), 164 (C), 165 (A), 166 (C), 167 (D), 168 (D), 169 (A), 170 (B), 171 (D), 172 (C), 173 (A), 174 (D), 175 (A), 176 (C), 177 (B), 178 (C), 179 (D), 180 (A), 181 (B), 182 (D), 183 (A), 184 (D), 185 (A), 186 (B), 187 (B), 188 (A), 189 (D), 190 (C), 191 (A).